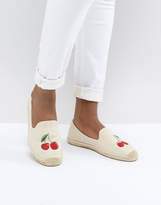 Espadrilles by Soludos, Sweet looks from the ground up, Slip-on style, Soludos tab, Cherry embroidery, Cute, right?, Rope midsole, Tonal stitching. Tired of searching for the perfect espadrille shoe in New York, Nick Brown founded Soludos in 2010 with an aim to replicate the classic style, comfort and flexibility treasured in the Mediterranean. 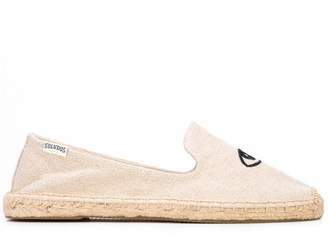 Crafted for women with a pure cotton upper and eco-friendly woven sole, this classic beach shoe is designed to stretch for a perfect fit. Look to bright colors, classic stripes and ice cream hues.